We recently met with Paul Trainer, founder and editor of Glasgowist, to ask him about working Anywhere as a journalist. 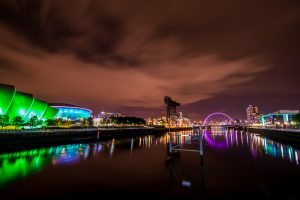 Glasgowist is an online magazine celebrating the best people and best places to visit in the city of Glasgow. With a host of reviews, interviews, and events coverage, Glasgowist serves as a colourful directory of new things to discover in the city. The mission of the business is to support independent journalism by providing established and aspiring journalists with opportunities, experience, and a platform to have their work published. Paul works with a distributed team of writers across Scotland and around the world. The Glasgowist ethos is that your location shouldn’t limit your capacity to achieve. 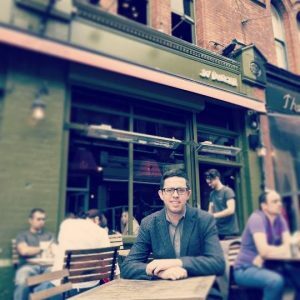 Paul tells us how working Anywhere benefits his business and his network of writers. Can you tell me a bit about your professional background and what led up to you starting your own online magazine? Well, when I was at school, I started writing for the local newspaper. After that, I ended up at the University of Strathclyde [studying Politics and History]. After I graduated, I went over to Dublin and worked in magazines which became my main focus there and after I came back to Glasgow, I started in digital agencies. That led me to try to marry some of the things I learned from the digital sphere with what I knew about creating magazines. That is where Glasgowist came from. In your experience in journalism before Glasgowist, is remote work common for writers? Do you think working Anywhere as a journalist is becoming more popular? I’ve certainly had a front row seat to see the evolution of the industry. I started off visiting newsrooms, these huge rooms kitted out with lots of people typing away on keyboards, and that has completely changed. The working model is different now. In the magazine sphere, there was a bit of both worlds because we would have a small staff of maybe three or four people in the office and an extended staff who could be anywhere. They could be across the city, they could be across the world if the story needed it. Technology started to make the way of working a lot easier. It was possible to track down resources in the run-up to deadlines and maintain contact with writers. So, when I started doing my own thing, an office and a tangible place to lock up at the end of the day was not the first thing in my line of sight. The most important thing was having a network of people who were accessible at all times and I think that’s what people in the industry are concentrating on now. Particularly in the writing sphere, it’s great if you can have a network of people who are fast to react, regardless of where they are or what they’re doing. When you were starting out, did you consider having an office and a staff of full-time writers? Or was working with a distributed team of writers always your first choice? I’m still considering an office. I was in publishing for a long time and I enjoyed having an office, but it’s an expensive commodity – to have somewhere to chat to folk and enjoy cups of tea between assignments. That’s all that’s really missing from what I have at the moment. The reality is, especially in the last couple of years, there are more and more co-working spaces and the concept of being able to rent a desk or a temporary space which can work much better. You now have places like CitizenM, Ace Hotels, cafes and public places that are actually inviting people like me, digital nomads who carry their office in their backpack and wander the streets looking for a good WiFi connection, to come in and work. In many cases, places like that have actually eliminated the need to have a set place where you only do your work. Do you think working from your home, coffee shops, hotels, trains etc. makes you more productive than you would be in an office setting? This is something that really depends on the person. Increasingly, as more people are allowed flexi-work, I think more employers are coming round to the idea now that as long as the work is done, employees don’t have to be sitting in front of you. There is a good collegial element to sitting with your co-workers, especially if a deadline is approaching and it’s good being able to coordinate together. But with the advent of places where individual groups of workers can go, you can still tap into that feeling of collaborative endeavour outwith an office and that’s a good thing. What do you think are the main challenges and benefits of working with a distributed team of writers? The main challenge is, if I were tied to a desk somewhere with my co-workers, you can make sure everything’s happening the way it’s supposed to. You’ve got that line of sight on the targets in front of you. Even I’m bad at that. Recently I was working on a magazine for a team in Dublin, they’re in their office and I’m on my couch writing away, I would get emails and calls from them because they’re expecting something by 12pm but I thought I had until 2pm. Sometimes, coordination can be harder when you’re not all together. The fantastic thing is, if you have a big project that needs continuous and sustained activity from a group of people, instead of opening up some huge office suite somewhere full of writers working on content, there are networked alternatives. I’ve got people who are in Glasgow, Dublin, Las Vegas, New York, and China, and they’re all working on the same publishing project at the same time and that’s great. How has working Anywhere impacted on your lifestyle? Does it give you more flexibility and opportunity to pursue additional projects? The capacity of your physical office shouldn’t limit the capacity or the ambition of your business. I mean, if you need people to assist you, a few or many depending of the project, all that is made possible because there are people outside of your office sitting in coffee shops, sitting in their homes, or sitting in other offices who you can access and technology has made that a lot easier. Is working as part of a distributed team of writers something you would recommend to aspiring journalists? One of the benefits of working distributed is flexibility. I mean, right now, I’m on a train, going in for a meeting in Glasgow, I’m speaking to a group of restaurateurs and then I’m going to a food market and I’ll speak to the people there and probably take some videos and photographs. At the same time, I’m updating the website’s social feeds from my phone and from my laptop. So, it’s possible to get out the office and actually experience the things and see the things that you’re writing about while still filing copy and checking email and everything else. That is a major breakthrough. I wouldn’t be able to do everything I do if I didn’t have the capacity to totally monitor what’s going on in the world; with the website, with contributors, with clients, and with the news if I didn’t work this way. So it is definitely possible to be a freelancer or part of a team of writers and do your own thing from a journalistic side of things. I think the capacity for freelancers to tap into networks of other publishers and to have their work published and available all around the world is really exciting. You don’t have to feel that you have to go and find a newspaper office. You could be writing for a different publication every day if you have the energy for such things. What are your hopes for the business going forward? I was talking about this yesterday, actually, and the main thing is continued growth. I’d like to grow the website in a way that I could grow the team and start providing and funding more independent local journalism. Beyond that, I’m lucky enough to have clients for digital content and I’d like to keep working with them and grow that side of things as well and still be in a situation where I can go around with a laptop on my back and consider myself someone who has a business.